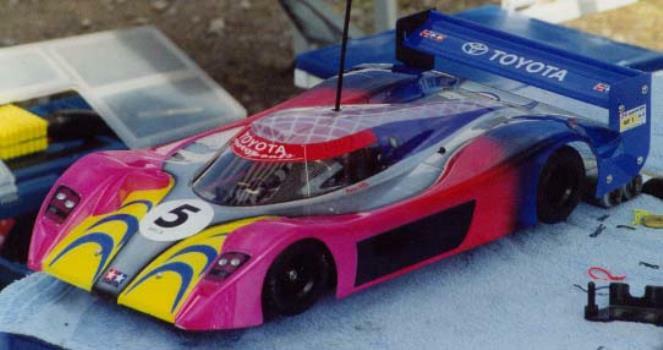 Tamiya introduced the Toyota GT-One on a formula-style chassis, preceding the similar Audi R8R and Porsche 911 GT1 LM releases. 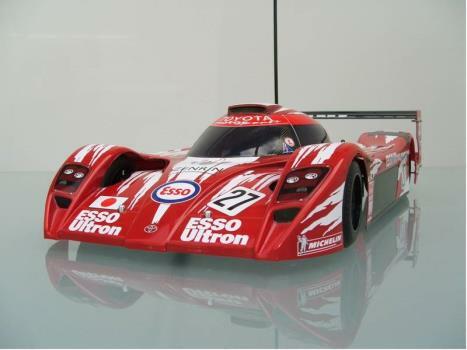 The car represented is the #27 racer that placed 9th (7th in class) at the 1998 Le Mans 24 Hours. The Type A Reinforced slick tires and Sport-Tuned 540 motor allow for rapid cornering and more straight-line speed, and the bodyshell's shape is said to produce more downforce than the Porsche and Audi shells. The striking red/white livery is reproduced using extensive decals. 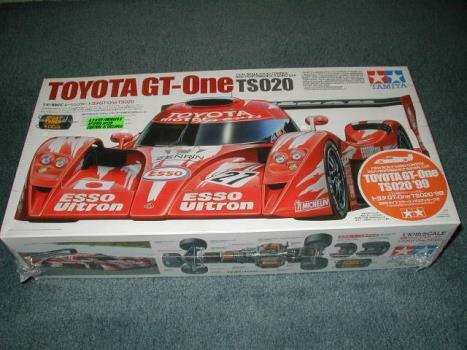 The Toyota GT-One was my very-first hobby-grade RC car. I had seen the car in the Gran Turismo video game series, where it was one of the highest-performing racers, and at the time I badly wanted to take the wheel of one of my own. 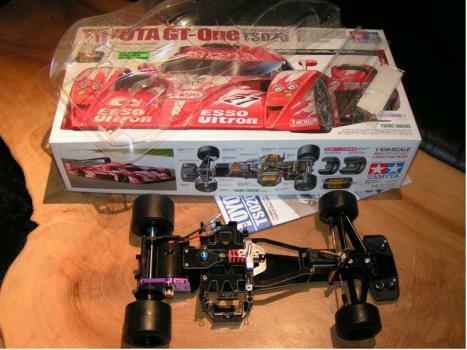 Well, RC cars allow one to do just that, but this was in 2011 - Tamiya's GT-One had been out of production for over ten years, and few other companies had an offering realistic enough for my tastes or currently in production. Thankfully there were a few on eBay. After some dropped hints and careful research, when I finished high school there was a big box waiting for me at the front door. I had never seen a 1:10 scale RC car before; previously I had only built static models and was not preparing for a box of that size. It left quite an impression! I write all that to give context: I would experience a Tamiya F103 as a near-complete beginner to the hobby. Even as a neophyte, however, I found the chassis easy and rewarding to build, with the exception of a few self-tapping screws and a nightmarish MSC that to this day has not been completely built. When I put it out on its first run, a massive grin plastered itself onto my face and stayed there - until I crashed and lost some nose decals! Little accidents like those helped me learn more about how to repair a car, and problems with the chassis were usually easy to trace with the car's simple construction. I was learning a lot about the hobby with my first car, and enjoying every single run with it. 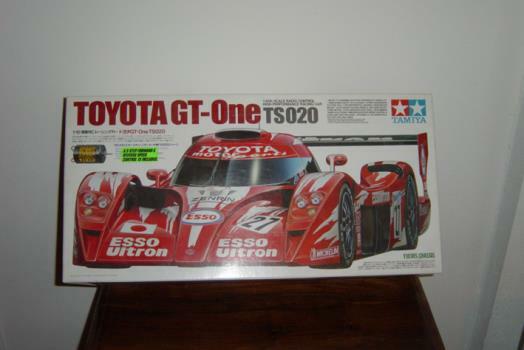 The memories of getting up at 7 in the morning to take the GT-One for a spin will stay with me for as long as I am in the hobby. With increased skill, I found the box-stock setup to be too slow. As it was my first car, I wanted to keep it exclusively Tamiya and so found OEM pieces to keep it running. However, the aftermarket support for the F103 is incredible in quality and quantity, and factory parts are still relatively-plentiful. The only persistent issues I have had with the car so far are concerned with the direct-drive system, namely that it is exposed. This aids adjustability and simplicity but where I was driving, small rocks and even wood-chips could lodge themselves in the stock gears and chew them up. The problems with Tamiya aluminum pinion wear do not help matters, and so it is probably the weakest section of the car. That being said, though, the car has been very reliable, and when it has failed I usually had a lesson to learn and quickly corrected my mistakes. In addition, the stock rubber tires seemed to lose grip rather quickly, making driving tricky in later sessions. For a racer, it probably means more traction compound, but for a basher the only solution is to take corners carefully. In summary, I found the car very easy to upgrade and tune, with many spare and hop-up parts available from many suppliers, and it is an excellent performer given its drivetrain. However, its exposed gears and faster-wearing stock rubber can cause problems for parking-lot racers and outdoor bashers. I still have mine today, running with the original kit-supplied Sport-Tuned motor, full ball bearings, stock tires, a 20T pinion and the stock spur, and a Dynamite ECX1070 to go along with a Spektrum SR300 receiver. It runs NiMH batteries and is controlled with a Spektrum DX3C. Note that certain upgrades are considered essential for better performance; my experience has convinced me that a Hi-Torque Servo Saver and turnbuckle tie-rods are necessary. These will improve steering and steering response noticeably! 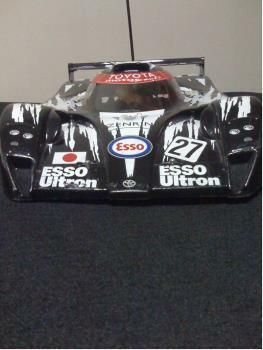 The GT-One is rarer today, though a re-released model (84266) with foam tires and very minor changes was issued by Tamiya. Me, I own my very own GT-One, a dream I have had since I played video games! That alone makes it an excellent model to own and even better to drive!